As of February 2017, the Office of the National Coordinator for Health Information Technology has designated four organizations as an Accredited Certification Body. 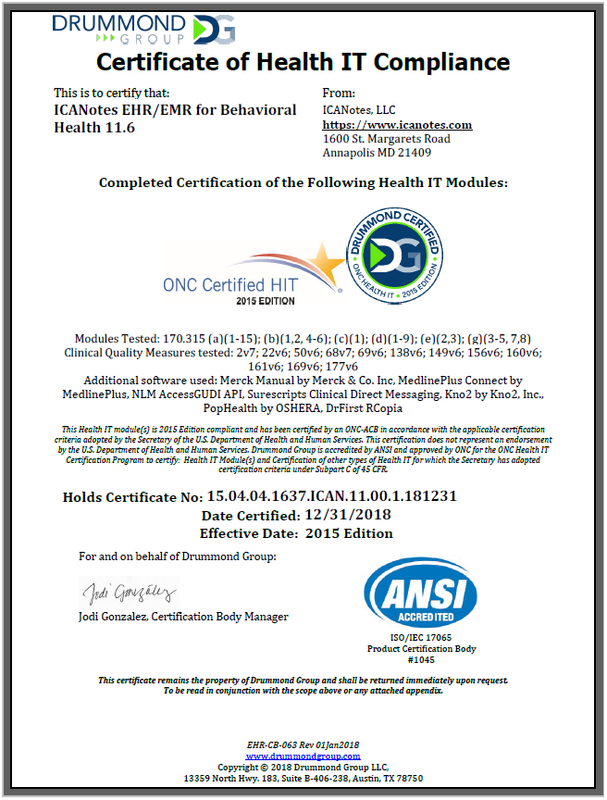 These organizations, known as ONC-ATLs, are therefore qualified to test and certify EHR systems. All ONC-ATLs use test procedures and criteria for EHR certification that were established by the National Institute of Standards and Technology (NIST). These requirements ensure that an EHR system meets meaningful use requirements as approved by the U.S. Secretary of Health & Human Services. ICANotes meets these standards and was certified by one of the accredited organizations, The Drummond Group, on December 31, 2018. Customer support related to Meaningful Use is limited to documentation. Additional fees are required for Meaningful Use training. A specific provider workflow is required and included in the documentation to ensure that Meaningful Use reporting is accurate.